2.2 Is the individual ready for treatment? There are many different ways to classify individuals with neck pain but in recent years the treatment based approach has emerged as a cost effective way to manage individuals with neck pain. The treatment based classification for individuals with neck pain was first proposed in 2004 by Childs et al, the system was based on the overall goal of treatment rather than an attempt to classify patients by pathology or symptom distribution. In 2007 Fritz and Brennan validated this classification system by finding that receiving interventions matched to the classification system was associated with better outcomes than receiving non-matched interventions. 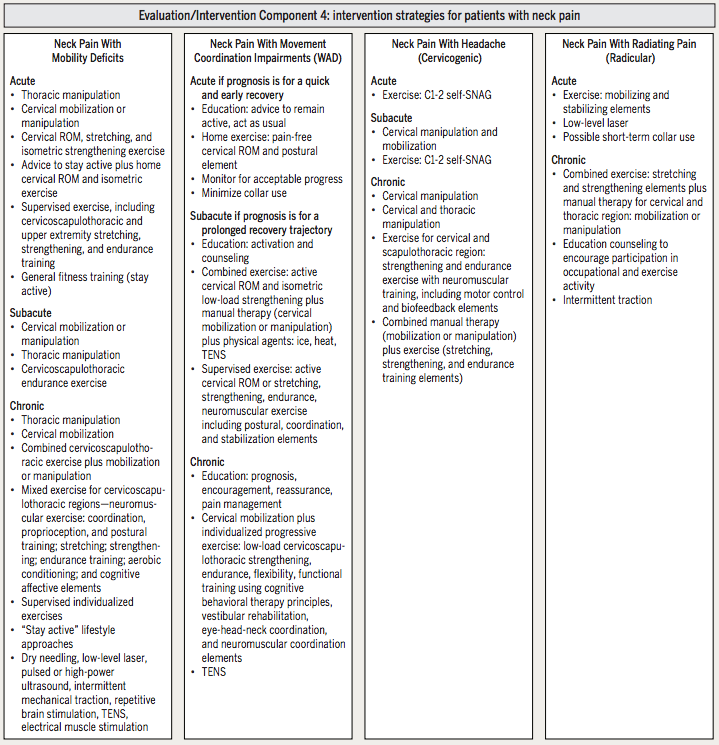 It was updated in 2008 as part of the APTA Orthopedic section ICF Guidelines with the four current classification categories including: neck pain with mobility deficits, neck pain with radiating pain (radicular), neck pain with movement coordination impairments (WAD), and neck pain with headache (cervicogenic). It is recognised that additional decision making is necessary within each classification to more specifically guide the application of the selected intervention. However, the first step in the use of a classification system is to direct initial interventions toward the optimal treatment for the individuals presentation. Proposed causes of neck pain include: degenerative changes, disc protrusion, nerve impingement and impaired function of muscle, connective tissue and nervous tissue. Beyond identifying serious pathology such as fractures, diagnostic imaging is not often useful in identifying the tissue source of the patient’s neck pain. Many imaging findings such as spondylosis and herniated discs are found commonly in individuals without pain Therefore, this classification is based on the patient’s presenting signs, symptoms, and impairments rather than pathoanatomical sources of pain and is designed to assist the clinician with matching an initial treatment intervention strategy to an individuals presentation. Initially individuals with neck pain should be properly screened for potentially serious pathology such as fracture, instability, CAD, myelopathy, cancer, infection, and visceral disorders. Is the individual ready for treatment? Psychosocial factors such as fear avoidance beliefs, depression, anxiety, and catastrophizing. Identifying psychosocial or environmental factors during the evaluation can direct the therapist to employ specific education strategies to optimise outcomes to physical therapy interventions. Once serious pathology has been ruled out and personal and environmental factors considered and the individual considered as suitable for intervention, the therapist can continue with the examination that will direct classification. Differential evaluation of musculoskeletal clinical findings is used to determine the most relevant physical impairments associated with the patient’s reported activity limitations and medical diagnosis. Therapists must recognise that these categories will not be exclusive or exhaustive, the assignation of an individual into the category that “best fits” their current clinical picture relies on clinical reasoning and judgment of the clinician. chronic conditions often have a low degree of irritability (pain that worsens with sustained end-range spinal movements or positions: overpressure into tissue resistance). Each individual has a primary goal of treatment at a given period during the course of management, making the classification categories mutually exclusive at a single point in time. However, the process of classification is ongoing and it is anticipated that an individuals presentation will change with time and treatment. Ongoing reassessment is, therefore, necessary to determine the most appropriate intervention at any point in time. ↑ 1.0 1.1 Childs MJ, Fritz JM, Piva SR, Whitman JM. 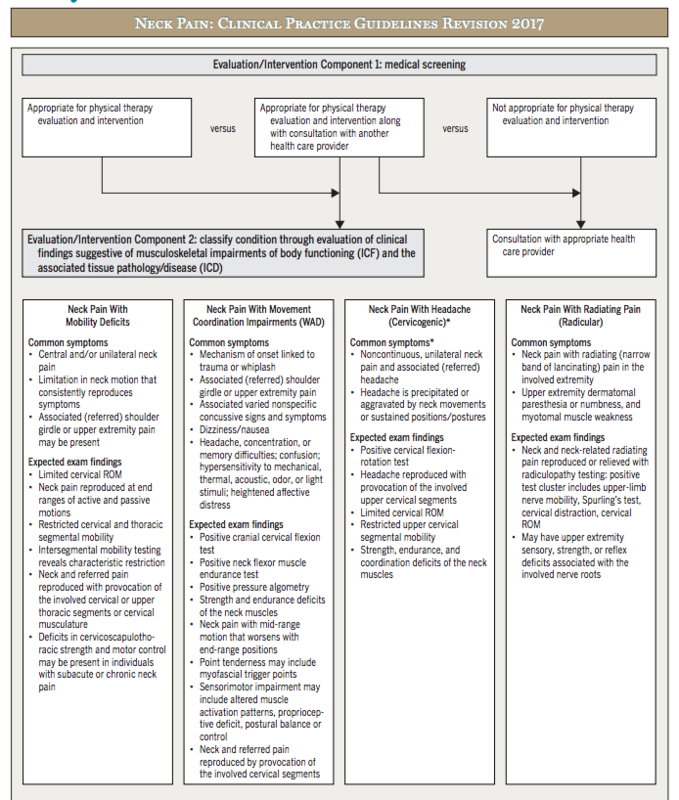 Proposal of a classification system for patients with neck pain. Journal of Orthopaedic & Sports Physical Therapy. 2004 Nov;34(11):686-700.